This is a lossless scalable vector image. Base size: 1000 × 625 pixels. 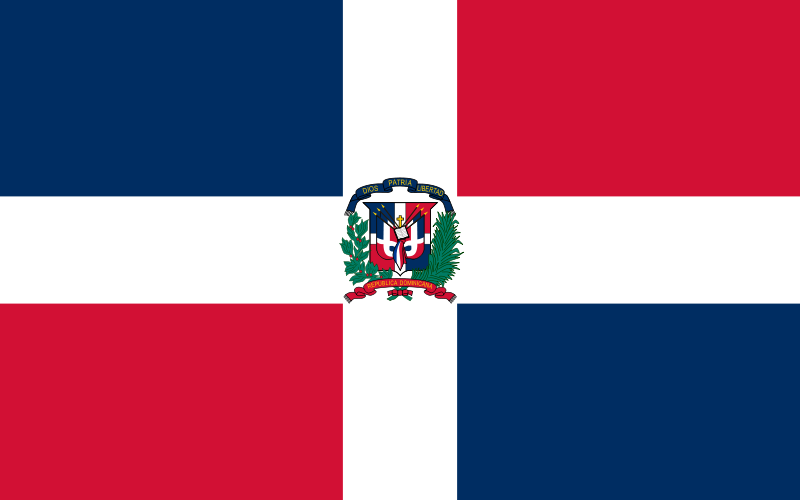 English: The national Flag of the Dominican Republic has a centered white cross that extends to the edges. It divides the flag blue (hoist side) and red, and the bottom ones are red (hoist side) and blue; a small coat of arms is at the center of the centre of the cross. This emblem is similar to the flag design and shows a bible, a cross of gold and 6 Dominican flags. There are branches of olive and palm around the shield and above on the ribbon is the motto "Dios, Patria, Libertad" ("God, Country, Freedom") and to aimble freedom. The blue is said to stand for liberty, red for the fire and blood of the independence struggle and the white cross is another ribbon bearing the name of the country "Republica Dominicana".